I am officially stepping out of my comfort zone. I love cooking and I am confident in the skills I have built since I was a college junior with an actual kitchen. A baker? Not so much. There are plenty of exhibits I can pull out for your reference, worthy of the #PinterestFail label. Some of them have even made it to the blog. If practice makes perfect, then I’m on my way to get my bakers’ wings or whisk or designated token. This is my first post with the Tuesdays with Dorie group. 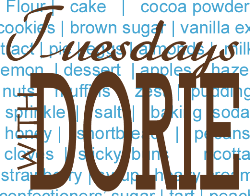 Tuesdays with Dorie is an online group started by Laurie Woodward, a home baker who received a copy of Dorie Greenspan’s Baking: From My Home To Yours back in 2008. Laurie enlisted her friend Jules to accompany her in this baking and blogging journey and the TwD phenomenon took off. At the group’s popularity height, it reached over 500 bloggers! The success of the group led to the creation of French Fridays with Dorie, the cooking group I have been participating in for well over three years. The TwD’ers wrapped up their “Baking” journey on December 2011, and began then working their way through Baking with Julia, also authored by Dorie Greenspan. With Baking Chez Moi (Dorie’s most recent tome) barely out of the oven, the TwD-ers have reconvened and will be baking from the book. The posts for these delicious treats will be up on the second and fourth Tuesdays of the month. So… if it’s your first time visiting, thank you for stopping by. Make sure to check my mini bio and as many posts as you’d like so we can get caught up and feel like old friends. You can also ask me anything about the blog, Puerto Rico, my baking successes and fiascos, etc. in the comments or through the blog’s Facebook and Twitter pages. Want more? Great Food 360˚ is also in Instagram and Pinterest. Housekeeping… done! On to the fun stuff. To kick off the TwD: Baking Chez Moi (BCM) journey, our moderators have selected Palets de Dames, Lille style. The word ‘palet’ translates to puck in English. If you enter “palets des dames Lille Style” into an online translator it will say something akin to ‘ladies shuffleboard Lille style”. We’re baking the Lille shuffleboard club’s favorite snack! 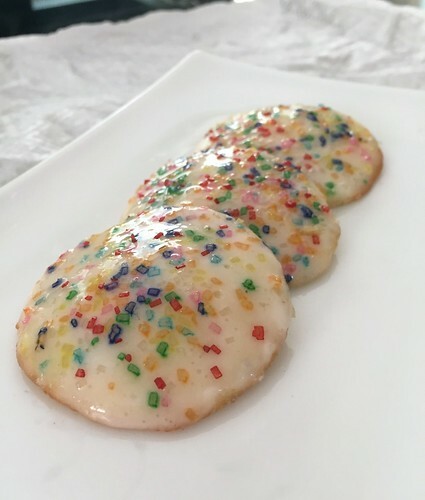 Jokes aside, the palets are cake-like sugar cookies that are dipped in a simple, lemony icing. 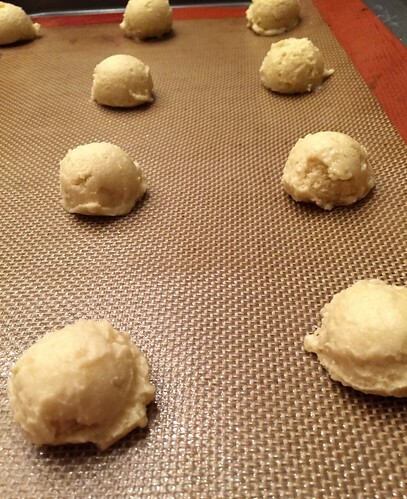 The dough for the cookies comes together in the stand mixer, chills in the refrigerator for at least an hour, and then gets scooped into cookie sheets for baking. One of my favorite things about BCM is that Dorie provides both the traditional and weighted measures for the ingredients. It was very easy to halve the batch of cookies to a manageable bakers’ dozen. Although I won’t be able to pull this off with every recipe, I’m aiming to be a Mardi Michels Minification Minion through the TwD run. I think my cookie drop is larger than the suggested 2 teaspoon one because I didn’t get the 20 cookies that the reduced batch yields per the book. I really liked the cakey texture of these cookies, and enjoyed them more without the icing and colored sugars. I’d love to try these next time with a chocolate glaze. Does anyone have a recipe they can share? Topped with colored sugars, the palets des dames would be perfect to take to work for birthdays… all the flavor and festiveness of cake, with minimal mess. Not even the dieters would be able to resist them! 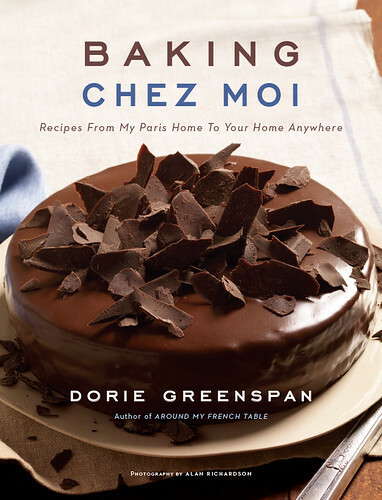 Tuesdays with Dorie is an online cooking group where bakers from all over the world join to work through the recipes of Dorie Greenspan’s Baking Chez Moi. Click here to meet the rest of the TwD:BCM team and check out their Palets des Dames Lille Style. See you all in two weeks! Oh my – that is too amusing “minification minion” 😉 (It works, what can I say?). It’s easy to minify when you bake with weight! Excited to start baking with you! Yes, I think we should all be Mardi mini minions…or is that Mini Mardi Minions??? I was just wondering if they tasted anything like “polvorones” or “mantecaditos”. No, Liana. They are literally flat little vanilla cakes. These are not crunchy or crumbly like polvorones. Your cookies looks really pretty with the coloured sugar sprinkles. Looks like this is a great start to your future baking adventures. Yup, see you in two weeks, looking forward to the next bake! Well done, Adriana!! Before you know it you will consider yourself a baker! If we had time I would tell you of all my fails…fortunately for me, they happened many years ago while I was still learning. Just keep up the good work…your cookies look lovely! My husband liked them better without the frosting too! Here’s to new adventures! Happy Baking! Oh so colourful! I am sure you will find that you will improve as you go through the recipes. I am still learning along as well. So glad you’ll be baking along with us! It’s a grand adventure. Your cookies look lovely. Thanks for the welcome, Jules. I’m really excited about the next few years of baking and friendship. Your sprinkles are the cutest! I am thrilled to have you baking along with us. Its going to be a super fun adventure. Thanks Laurie! It’s been so much fun already, although I face one of my baking nemesis next week: tart crust. Very happy to be here! Looking forward to another fun trip together. 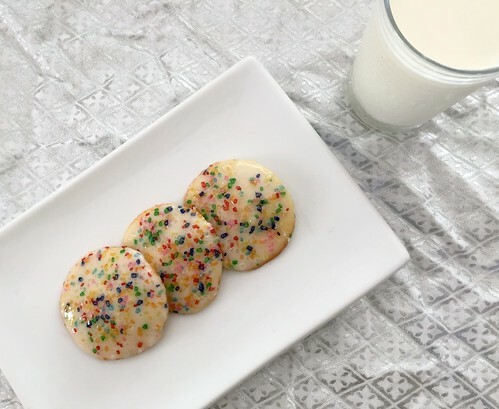 Your cookies look delicious, love all the sprinkles, so very festive. Two words, dear Cher: tart nachos. I’m already working on strategies to counter all my main baking shortcomings, starting with the dreaded tart crusts. Love the cheerful colors on your cookies- how fun ! I am so excited to start this new adventure and hope I can keep up. Nana and I did the Baking with Julia for a few weeks (if that….) but it was too much at the time to do the cooking and the commenting. Fingers crossed we can make through the months where we are cooking both books. If energy fails I can always make more of these cookies for a sugar rush 🙂 So glad to be on the journey with you. PS- my kitty was chucking these off the plate that was not being photographed while I tried to take pics for the blog. Good thing I love that little guy. I love also love that Dorie included metric weight in the recipes. Its the only way to really be accurate and its much easier to weigh than measure! We will all be honing our baking skills through Baking Chez Moi! Your cookies look pretty and delicious! Mine were too small. I got almost 30 bite sized (or really 1/2 a bite sized) cookies. They must have been super cute, though! Adriana, your cookies turned out beautifully! I, too, really appreciate that Dorie included weight measurements in this book – it makes reducing (or increasing) the recipe that much easier. Adriana, these are so lovely – like stained glass windows on top. No-one would ever think that baking was not natural to you. I would love some of these now (they are sooooo good). Adriana, your cookies look delicious! They are definitely a departure from something crisp, but I love your idea of a mini-birthday cake! How cute, and you’re right, no one could pass that up! I made mine again too (made them for the Dorie birthday), still delicious!! Love the Minification! I too will be trying that throughout the baking run! Your cookies turned out just lovely and I really like the multicolor speckles! They are good without the icing, though, so I agree with that! It is my first time baking with TWD too. We are opposites as I worry more about ruining a good piece of meat than I do about baking. Great post, Adriana! I’m very excited about baking through this lovely book and I know you’ll do fine! Fun sprinkles!!! I am so glad you are baking along! I know you will have many successes! Wow..here we are baking together..very fun and such a cool adventure! I’m glad we are taking the leap to bake our way through Dorie’s beautiful latest cookbook creation and it is a beauty! Love your rainbow sprinkles! Fun to join TWD again and get to “meet” new bloggers! I love the colorful sprinkles that you used!! Beautiful photos too! With Dorie’s instructions, you’ll be an accomplished baker in no time. I suspect we’ll all be thrilled with what we’ve accomplished when we’ve worked our way through the book, just as we’ve been with French Fridays. You are right, Teresa! I can’t wait for all the a-ha moments we’ll take away from BCM. Welcome to baking Adriana! Dori’s recipes are well written and easy to follow. You are off to a good start with your beautiful cookies. I love the colored sprinkles! What a fun addition. I’m excited to start baking through BCM with you. It looks like a great book! great to see you baking with us! looks like you can already handle yourself in the pastry kitchen pretty well….your cookies are adorable! I wonder if a chocolate ganache (made a tiny bit loose so it’s dip-able) would be good on these? Your cookies are beautiful. I look forward to baking with you. Your cookies are so pretty with that colorful sugar – I love them! I too was happy to see that Dorie included weighted measurements in BCM, but I didn’t occur to me to try halving the recipe. I will keep that in mind for the future. You’ll be a baker by the end of the book (or earlier). I love the color sprinkles on your palets. I made these for the FFWD Dorie birthday celebration so I’m delaying my BCM participation for another recipe. I’m only going to make things that I think I’ll like, so it probably won’t be until December. Have fun! It looks like the cookie scoop did the trick! 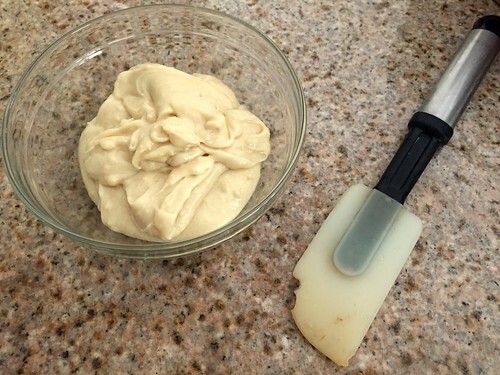 I thought the dough was too wet for a scoop. Your cookies are so pretty! I liked mine straight out of the oven, no icing.